Adam (As) had a son named sheeth (As) and sheeth was a gift and even the name sheeth means gift. Sheeth was a gift that was given by Allah (SWT) to Adam (As) after the death of his son HABIL. habil was a righteous son a righteous servant of Allah, so Adam as a righteous man who was attached to habil. After the death of habil he becomes very upset and Allah (SWT) replaced habil with Sheeth (AS). He was not only a righteous man but a Prophet and a messenger of Allah and Adam named him sheeth as a gift the gift of Allah (SWT). This son of Adam was very close to him he obeyed the instructions he learned from his father he actually used to remind his brothers, nephews, and grandnephews whilst Adam (As) was alive as well he continued to remind and to remind people of the beginning because there was nothing else to remind them about at that particular time besides to worship Allah alone and how shaytan had made a promise and so on. 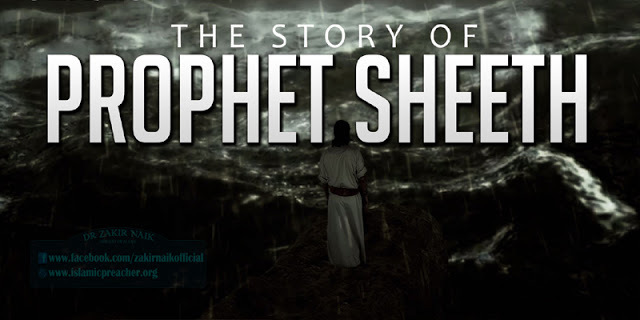 Sheeth after the death of his father Adam (As) he ruled the children’s of Adam (As) and he ruled with justice, he ruled in accordance to Allah’s law and he brought unity between the people around him everything is going well but shaytan could not stop his plotting. On the other hand, Qabil and the descendants of Qabil grew and grew more than the people around sheeth. Here is the little interdiction of Adam’s another son his name was Qabil of Kane. He had aggressiveness in his behavior he had greed, arrogance he was a tough character so he found difficult to go along with so what he did he decided to depart, to leave the rest and go away on his own somewhere very far away. Adam (AS) prior to his death he used to live with sheeth (As) and with all these other children’s of his in the mountainous regions in the mountains. So this young man (Qabil) decided to go to the valleys and flatlands somewhere further away. Later on sheeth (As) was given an instruction by Allah (SWT) part of his sharia (law) was that “it was prohibited to mix with the people who were gone on to the other side”. Now there was a distinct sign you could see very clearly the man for Qabils side were not very good looking we heard about that and the women were very good looking when it comes to where sheeth (As) and the rest of them were the men were very good looking and the women were not that good looking according to narrations I’m not speaking obviously from my own pocket here. On the other hand sheet (AS) kept on reminding his people he kept on telling them what is right and what is wrong and on this hand, we find that shaytan teaches them how to do evil how to create evil. So the flute was made and it sounds nice it says that when he brought the flute to them they started to move their bodies to the flute. Similar to that when you hear musical instruments every part of your body reacts to it. So they began to dance. This is how he introduced the musical instruments into existence. With the help of it he would control them they literally set aside a day and evening a Saturday evening and amazingly to this day it lasts. They set aside that evening where he would create these sounds everybody would come around and they would listen to him and enjoys like we do in parties and clubs may Allah forgive us. Until there came a time when some of the youth from sheeth (As) were visited by shaytan and what did he do to them? Something interesting he went to them and he placed a doubt in their minds he made them ask a question about the law of Allah why is it that we are not allowed to mix with these cousins and relative of ours? What is this law all about? What is the reasoning? What is so bad about them? It is said that the people of the mountains began to hear this flute some men were passing by came close and here these sounds. Some of them decided let’s just have a peep at what’s happening. So they came down from the mountains and they went from the distance they were watching and they liked the sound and they went in the direction because they didn’t know where they were they literally become unconscious. They heard the flute one day and it attracted them and they went towards that direction and these men say the good-looking women’s of that land and these men’s are good looking too. So women‘s began to engage in what is known as TABARRUJ means to start displaying their beauty and to start dressing up in order to attract them. This was the first time shaytan taught them this. So the men and the women began to intermingle through the music and getting together in such as fashion it resulted in the natural and biological interactions. Reaction inside the man and the women and shaytan played his role so free mixing began to occur without any boundaries. Scholars say that this is when Zina began this is when adultery and fornication began slowly but surely with the introduction of this first flute and music which called for a celebration between men and women gathering dancing and over time Zina was carried out. These young men came in and they enjoyed themselves they had music they had women’s they had so much new to explore. So as these men came back they propagate it to other youngsters you don’t know what you’re missing out. Now when they came back they came back with a mass of people. Now the first sin on a collective level like lots of people does it was ZINA adultery and fornication. The other sin was done on an individual level and look what happened so imagine now when a sin is done on a collective level keep in mind people did not commit shirkh (is when people do certain acts of worship making partners to Allah (Swt) in those different acts of worship) as yet, but bit by bit the shaytan takes the human race to the second level, 3rd level and so on.